The four-generation Family Explorer chart is provided on each person's page in both Genealogical sketches and Thurmon King's database. The chart may be used to navigate to children, siblings, or ancestors. It replaces the three-generation ancestors-only Pedigree chart. The chart icon may be toggled on or off. 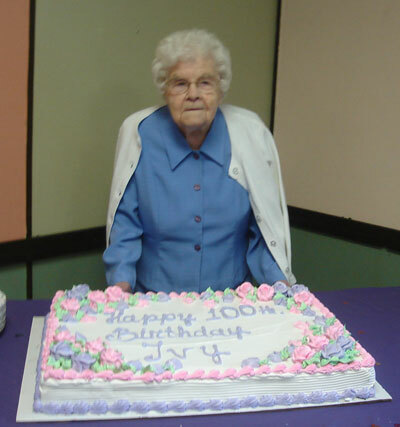 Ivy Florence (Sackett) Alger celebrates her 106th birthday today. We wish her a joyful day and many happy returns. Ivy was born in Canterbury, Kent, England, and emigrated to Canada at the age of 13 as a Barnado's girl. Thank you to granddaughter-in-law Sandy Alger for information and the photograph.